This summer at the Southbank Patch & Picnic is a celebration of the best of outdoors games, picnic platters, hampers and drinks. 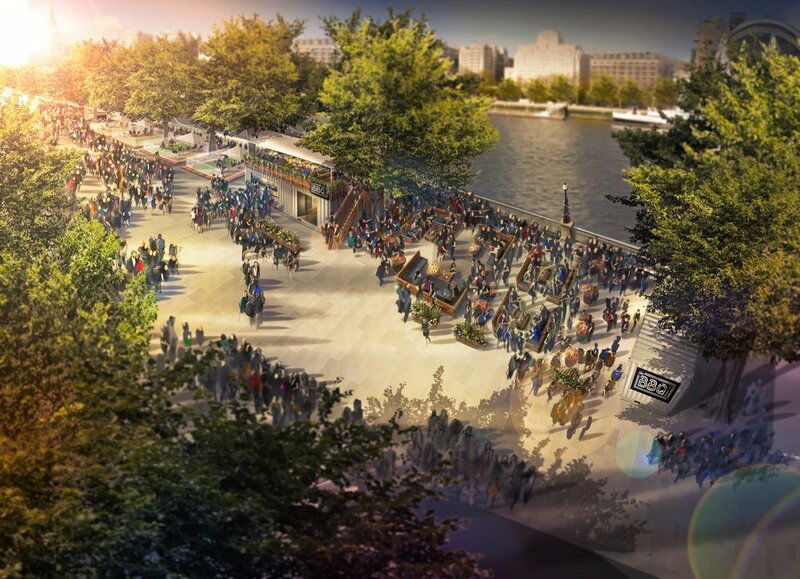 Patch & Picnic will allow guests to enjoy the best of the riverside. From our riverside boardwalk bar, perfect for an afternoon drink, to our bookable picnic and games areas providing a patch of central London for groups to enjoy. We provide quintessentially summer lawn games (boules, beach tennis and swing-ball to name a few), craft G&Ts or magnums of rose and beautiful platters and hampers to share… The perfect way to spend a summers day or evening. Our patches are bookable for 75 minutes or more in the centre of London's Southbank based on a minimum spend. If picnics arent your thing, our BBQ Club pop up next door has you covered from its street food menu to sit down 6 course dinner. P&P also has a dedicated bar supplying refreshing cocktails, craft beers, wines, and soft drinks, and each area comes with private seating and parasols for sunshade. P&P consists of 4 bookable areas for groups of 6-12, or combined areas of up to 130 and offers group picnic and feasting menus for private hires for those beautiful summer parties. P&P is a space for eating, drinking, meeting and unwinding. Built around our 4 ‘patch’ garden areas that are open on all-sides with riverside views. P&P offers a beautiful summer space for work parties and private events, with capacity for up to 130 alongside the Queens Walk. Our menu focuses on simple, great picnic hampers, sharing boards and street food. Served by a dedicated bar there’s a wide selection of hand picked spring/summer wines, beers and classic cocktails as well as bespoke P&P creations. The Queens Walk has been transformed into a picturesque garden along the Thames with garden games, wooden benches, deckchairs and blankets for a little later in the evening. It’s this summer’s calm in the centre of London, ideal for hiding away from the rest of the city while enjoying the sun! If you’d like to have your party with us please complete the form below to find out how we could offer everything from a riverside sit down dinner to drinks receptions.